We live in a college football town. Once the college football season starts, during every home game the city gets a little crazy. Everyone literally bleeds green and white. This past Saturday I had forgotten it was a game day until we pulled into the drive thru and the person in front of us had painted themselves green. Yeah, it's that kind of city. Everywhere I went - the bank, grocery store you name it everyone was wearing green. Our state is divided. There are two big schools, Marshall and WVU (West Virginia University). Since there are no professional teams in our state, college teams reign king. While both schools have a large alumni base, most of the fans of both teams never went to school at either university. Somehow though they feel a connection to their football teams and get very adamant that their team is the best during games. According to my husband twitter gets a little crazy with back and forths between fans. So for Saturdays during the season we are a Marshall town through and through. Football season means lots of chili and game day foods, but with 95 degree days we are still enjoying food that sticks to the ribs a little less. I am a little behind on posts, so the recipe I am sharing tonight I actually made a few weeks back. I tried a new recipe for Thai Coconut Chicken with Pineapple Salsa from the April 2012 issue of Martha Stewart Living. This recipe has 12 ingredients. It takes 35 minutes of total time, 25 minutes of which is active and makes 4 servings. I only made a few changes to the original recipe. First, since I have never actually seen a fresh Thai chili at any store in my area, I substituted a jalapeno. I left the seeds in since my kids weren't going to be eating the dish. For the oil I used peanut oil, I love cooking at high temps with peanut oil, it's great. The recipe states that the dish turns out brothy, but I found that it didn't make as much broth as the photo in the magazine showed. It was still enough for three servings, but not like the soup shown in the photo. My husband and I were big fans of this recipe. The flavors from the fish sauce and ginger were delicious and the spicy kick from the jalapeno was perfect. I liked that the broth was slightly sweet and savory, while the salsa was a little on the spicy side. They worked perfectly together and the flavors played off of each other nicely. 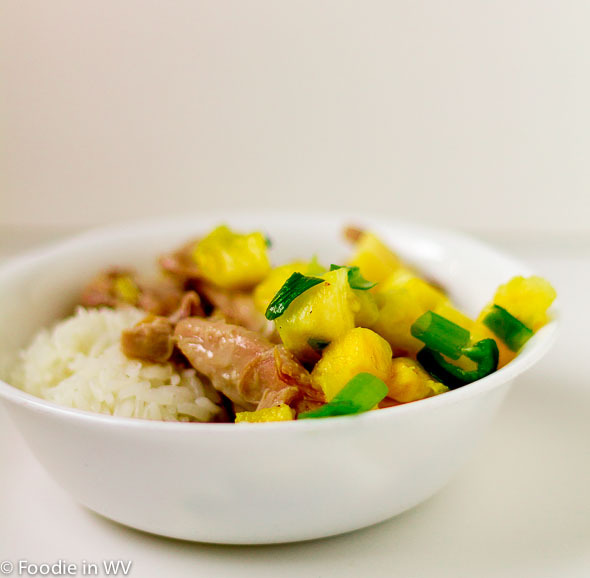 For the recipe go to Thai Coconut Chicken with Pineapple Salsa. We bleed orange and blue (University of Florida Gators) and live in the town that bleeds Garnet and Gold ( Florida State University). Happy football season :) I can imagine that it can get pretty crazy in Florida with football rivalries! Being from Boston, I can totally understand the love of sports. Boston fans are intense! I think I would love this recipe. Coconut is one of my faves. I have met some very intense Boston fans before :) I love coconut also, it is great in so many things! Go OSU! I'm sorry, I had to. That pineapple salsa would go great with shrimp I bet. I'm making a mango-habanero salsa tomorrow for a shrimp dish which I hope will be a hit. I've never worked with habanero so I'm leary. I'm a HUGE Patriots fan, but I have to admit that I don't know a thing about college football. My dad was always a football fanatic, both pro and college so that's the only reason I know anything about it :) Plus when I was an undergrad my school was the national champ so the whole campus went football crazy! This looks great! Did you use a GF fish sauce? I haven't checked labels lately but assume most have wheat in them. The brand of fish sauce I buy doesn't have gluten. I'm not sure though if that is true for all fish sauce. I buy a lot of my specialty sauces online. It can be hard to find a lot of things in my area, especially gluten free. This looks super delicious. I love pineapples and this combinations sounds delicious. 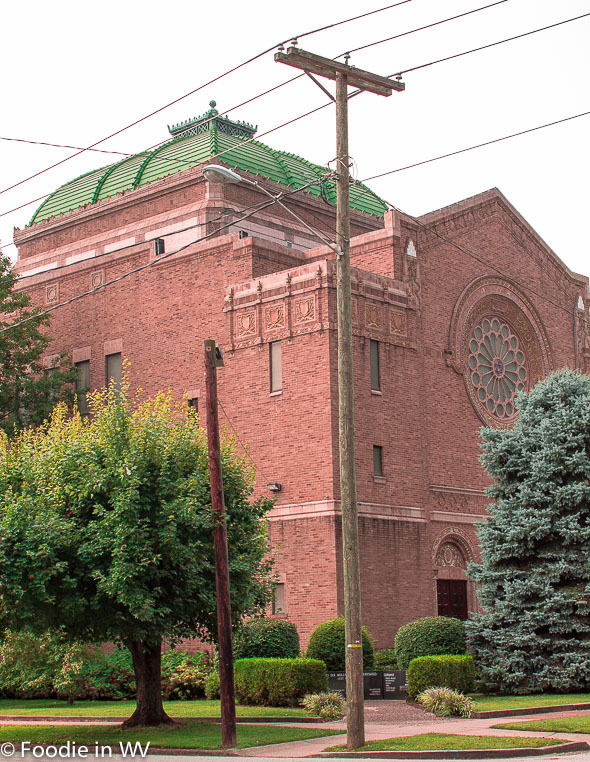 Those are some beautiful photos of the Synagogue. 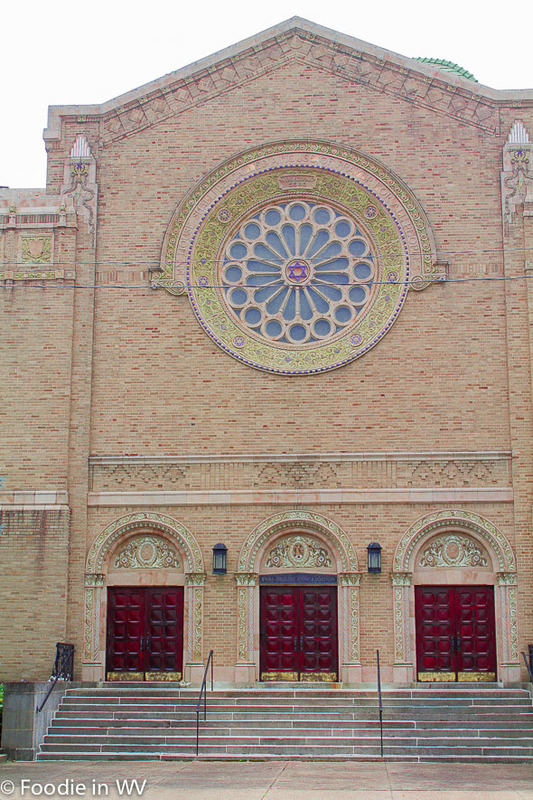 WV has some very beautiful buildings and I really love seeing your photos of them. We love pineapple in our house too. My boys can pretty much eat a whole fresh pineapple between the two of them :) Thanks for the sweet comments, there are a lot of great things to photograph in my city! No removing thea jalapeno for me and the hubby because we LOVE spicy food, in fact you inspired me to try a recipe on found in a Better Homes and Garden cookbook. The recipe is Spicy Thai Chicken. I love spicy foods too, but my boys can be hit or miss. Better Homes and Gardens has some great recipes. I hope your chicken turned out delicious! We're in Michigan and every time I head into Ann Arbor for something I seem to be wearing Spartans colors (the big rival team of the town). It's hilarious because I hardly ever wear the jersey, but when I do I seem to be headed to enemy territory, lol. I like the pineapple in the dish. It adds just the right sweet touch, I betcha'! My in-laws both went to WVU, but my husband went to Marshall so we have two rival teams in our family :) It's funny with college football teams and how into the sport people can get! The pineapple does add a nice bit of sweetness! So happy it's football season again. It's sad that NY really has no college football passion. Very little here to root for as far as college goes. We are all about pro-sports here. Love this dish. It looks delish! Seattle had University of Washington, but my dad was always a much bigger pro fan so that was more what I grew up with :) I didn't even go to a game when they were national champs (and I was in school there - opps!). This sounds like Friday Night Lights (I"m currently obsessed with)-HA! I'm in love with thai coconut dishes-yum! I've only watched a couple of episodes, but I know a bunch of people that love it :) I agree about coconut dishes, I love them too!